Wondering how to take a taxi in Rome? Find out how to get one, what they cost, whether you should take it to/from the airport and...how not to get ripped off! Planning to take a taxi in Rome? Since 2001 when I moved here and my husband and I started our B&B, I've helped thousands of people (friends, family and especially hotel guests) get taxis to get around Rome and to get to/from the airports and train stations. And obviously I take them myself. Can you pay the taxi in Rome with credit card? Will the taxi in Rome be air-conditioned? Is it better to take a taxi or the metro to the train station in Rome? Is there Uber in Rome? There is usually an orange sign with the word "TAXI" on it, and there you should see white city taxis lined up. You just go to the one at the front of the line. If there is a jumble of them, or it's not clear who is first, trust me, they will let you know. They have a code of honor about this. A typical taxi stand in Rome - see the orange taxi sign? There are taxi stands all over Rome: at the airports, train stations, and almost at least one in front of every major tourist site or monument. At the time of this writing (summer 2017), there are NO TAXIS at the taxi stand in front of St. Peter's Basilica. Not one. Anywhere in sight. I presume this is a security measure and I am not sure when they might come back. 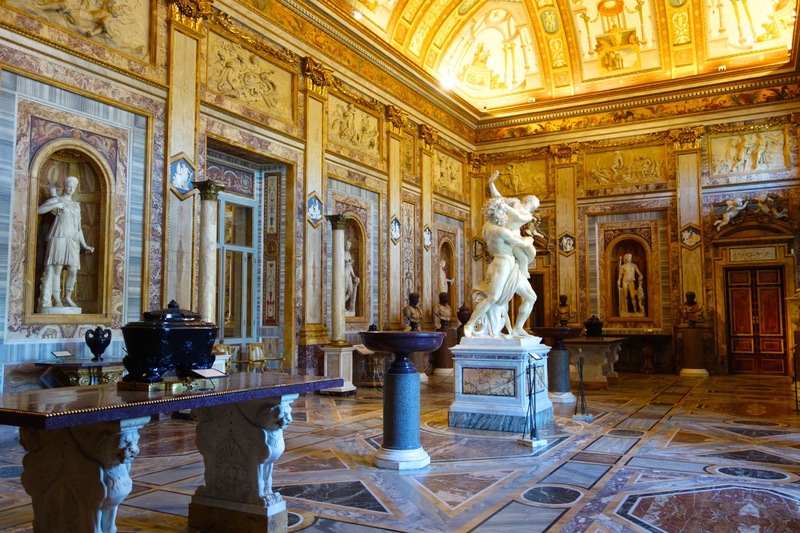 If you exit the Vatican Museums through the same door where you entered, you will see a taxi stand there to your left. If you are exiting St. Peter's Basilica, to find the closest taxi stand, walk out of St. Peter's Square. Walk around the iron barriers, hugging the colonnade. When you've almost come to the Swiss Guard, take a left on via delle Fornaci. Walk along that street, taking the little pedestrian underpass, and once you exit the underpass, you will see the taxi stand on your left. It's less than a five minute walk from St. Peter's Square. This is not a common way to get a taxi in Rome. You are unlikely to find taxis driving around, empty and available. If they are driving, they are likely with a fare. If they are empty, they are likely done for the day and heading home, or answering a radio booking, or getting to the nearest taxi rank. You can try to hail a taxi, especially if you are feeling a bit exhausted and just don't want to search for a taxi stand. However, you are likely to be passed over, and, if one stops, they may ask first where you are going, to see if it's convenient for them. I can't tell you the times I have asked a passing taxi driver to take me someplace only to be told it was not on his way. So let's just say this is the least reliable way to get a taxi in Rome. If you have a way to make a phone call, you can call for a taxi in Rome. I find, however, most of the time, visitors to Rome rely on their hotel concierge to call for them. The same goes for restaurants, shops and bars. Just ask them to call a taxi for you and most are happy to oblige. The taxis usually come within 3-5 minutes of the phone call, so don't ask for someone to call you a taxi until you are really ready to go. When you call (or someone calls) for a taxi in Rome, you will be given the ID of the taxi coming for you. It's what's written on the door of the car, and is usually a city name followed by a number. Something like Rimini 15. So make sure to look for that when the taxi pulls up, and only take the car coming for you and not some random taxi who happens to pull up first. The driver turns on the meter once (s)he answers the call, so your taxi will arrive with more than the base fare already on the meter. This is from the website of the Rome Tourist Board. I suggest you check there for the most up-to-date fares for taking a taxi in Rome. T3 € 1,60 per km until you end the trip. The first piece of luggage is free. Additional pieces of luggage are 1€ each. There is a 2€ surcharge for leaving/arriving at Termini station. There SHOULD be a 10% discount for single women at night. I've asked some drivers about this when it applies to me, and almost none of them have heard of this rule! But they will apply it if asked. There is an hourly rate if you have your driver wait for you, of 27€/hr. Between Rome and Ciampino, the fixed rate is 30€. Between Rome and Fiumicino, the fixed rate is 48€. These rates are set by the city of Rome. They are for one-way, up to 4 people, with luggage included. Can you pay for a taxi in Rome with A credit card? All Rome city taxis are required by law to have POS machines. This means you SHOULD be able to pay with a credit card. You probably won't be able to pay with American Express, which is somewhat unpopular among merchants in Italy due to the high fees they have to pay to accept it. Also, just be aware it is common in Italy for POS machines to mysteriously be "out of order." So I suggest you plan to be able to pay in cash, just in case. How much should you tip a taxi driver in Rome? If you take a white metered taxi in Rome, you do not need to tip. Not one penny. It is just not the custom or the culture here. And, don't worry, if you over-tip, you are not offending anyone. If you take a private car service to the airport, you can tip 5-10 Euros max. To Civitavecchia, depending on how many you are, you can tip 10-30 Euros. But none of that is actually necessary. It's only if the driver has been very helpful and/or you feel compelled. Italy is just not a tipping-oriented country. I can't tell you the number of times I have gotten into a taxi in sweltering sticky hot summer in Rome, and found the a/c turned off and the windows all rolled down. You know, for that hot breeze to flow through. I know this may come as a surprise but, in Italy, there is a kind of fear of air-conditioning. Many people truly believe it's bad for you and can cause any number of ailments. According to some, one big bad way to get sick is to get into a very cold room or car after sweating. So for them, it's best to keep the a/c off and live another day. Ahem. You can ask the driver to turn on the a/c, and usually they will. One way to be sure you get a taxi in Rome with a/c and functioning POS machine is to call 06 3570 and ask for (or tell whoever is calling for you to ask for) "servizio gold", which means a higher level of service. To get to either airport by city taxi, you can catch one at the train station (in which case the 2€ Termini surcharge is no longer applied), or, you can call one or have someone call for you. When you arrive at either of Rome's airports, you can walk outside and simply grab one of the white city taxis lined up there. You can also book (and pay in advance) for a private car service, which will give you peace of mind and taking the guessing out of it for you. The last option, and one I don't recommend, is to take a private taxi from the airport, from someone who approaches you. You just cannot be sure of the rate or that he/she will honor what rate they give you, without adding last minute "tolls" or other fees. See below to find out how to avoid being scammed by unscrupulous taxi drivers in Rome. Either way, as long as you take a ROME city taxi, to/from WITHIN the Aurelian Walls, the rates will be guaranteed at 48€ one way for Fiumicino/Rome and 30€ one way for Ciampino/Rome. If you have an early flight, and need a taxi at 4am, you can ask your hotel concierge to call for you when you are ready to go. Taxis usually come within 5 minutes of the phone call. If you are staying at an apartment, or otherwise have no way to call, you can make sure you know in advance where the nearest taxi rank is, and simply go there when you are ready. Depending on how far away the taxi stand is, this may not be a great idea at that hour, just because you are unlikely to want to have to drag your luggage around with you in the middle of the night, getting to a taxi stand. And, you are not guaranteed to find a taxi there, although there usually are. For early taxis, if you cannot call for one, I suggest booking a car service in advance. These private services are reliable, and again, you have peace of mind knowing someone will pick you up, and of the price being set. Our B&B was right by a metro stop, so I got this question all the time. There are not escalators or elevators at all metro stops around Rome, so if you have walking issues or are carrying/wheeling heavy luggage, just be prepared that you might have to deal with stairs. Once you arrive by Metro at Termini (or Tiburtina), you will have to come up several levels into the main train terminal. There are escalators. There is a 2€ surcharge for taxi pickups/dropoffs at Termini. If you are going to catch the Leonardo Express to Fiumicino, ask your driver to drop you at via Giolitti, closer to where that train leaves from, so you have less walking inside the station. Typically it costs anywhere from 8-15 Euros for a trip between the train station and most places around central Rome. It should not cost more than 20€. There was for a while. Sort of. At the time of this writing, summer 2017, Uber has been banned in Italy. It seems there is a limited version of it, called UberBlack. This service only allows for private limo drivers to be Uber drivers. The same ones you would hire to get to/from the airport. Friends and family who love and normally use Uber back home have told me they don't find this service to be that useful or much of a savings, at least not in Rome. Stay tuned but in the meantime, you'll probably do best to stick with taxis as described above. I am going to start by saying I have had nothing but positive experiences with taxis in Rome. Granted, I live here and speak Italian, but my impression is that most drivers are honest and not trying to scam tourists. I also have to say I have never heard of a Rome city taxi driver trying to cheat a tourist when going within points in the city. They just turn on the meter and you pay what it says and that's the end of it. When unscrupulous drivers do decide to try to swindle tourists, the scams seem to be focused on people arriving at Fiumicino (and sometimes Ciampino) and Termini station, i.e. people who may be tired, distracted and otherwise just want to get where they are going and who are not thinking too much about the actual fare. I've actually had many visitors who have been ripped off tell me, "yes I knew he was scamming me, but I was tired and just wanted to get into my room and have a shower." If you take a white metered taxi from Fiumicino airport, make sure it is registered in Rome and not the town of Fiumicino. The Rome city taxis are obliged to charge the set fare of 48 Euros into Rome, while a Fiumicino registered taxi is legally able to simply turn on the meter, which can result in a much higher fare. There is also the matter of going INSIDE the Aurelian Walls. More about that here. At Termini station and especially at Fiumicino airport, you will find a lot of people coming up to you and ASKING you if you need a taxi. I suggest you ignore these hawkers and take either a white metered taxi or, have booked a private service in advance. When you do get into a white, metered taxi, and are not going to pay the guaranteed airport rate, make sure the driver turns on the meter right away. I have had drivers forget, in good faith, and we usually agree on what part of the fare could be missing, and it's always fair (to me.) But, some drivers leave the meter off and then tell you oops, it's not working or I forgot, we'll just say 20€ ok? And no, it's not ok. If they don't turn on the meter right when you get in, tell them you want to get out. Get the next taxi. If you do get into a non-metered taxi, which are called “NCC" (noleggio con conducente, meaning hired with driver), set the rate before you get in. Make sure it is the final rate including tolls (there are none), and baggage. The rate in town from Termini should be less than 20€ (but they will all try to charge much more), and the rate from Fiumicino should be in the area of 50-60 Euros for a standard car service for 3-4 people with luggage. The rate from Ciampino should be 30-40€. If you agree to take a private car service with a driver who approaches you in the airport, make sure you are the only ones who will be in the car. I have heard stories of people being taken to a private minivan, asked to sit there, and then even locked in while the driver went back inside the airport to look for more fares to collect on the same ride. This is a big one. This warning applies to private and public taxis: When you arrive at your hotel in Rome, do not pay the driver until after you have gotten your luggage out of the back of the car. When you pay the driver, take the money out and hold it, asking him or her to get change while you hold the bill(s). I have heard many stories of drivers insisting that the passenger “only" gave a 5 instead of a 50, or a 10 instead of 100, and insisting on the rest of the money. For the most part, you should not spend more than 15-20€ one way for a taxi in Rome. That includes a night, weekend or holiday trip too (the rates start higher.) For example, from Termini to the Vatican (across the river), during a normal weekday, should cost around 10€. I found this interesting site that lets you plug in two addresses, and tells you what the fare should be. You can try that if you want to estimate the fare in advance. First, tell the driver you want all his information. Write it all down, and get (even take a picture of) the information on the side of the car. Make sure you note the taxi company. GET A RECEIPT. Tell the driver you are planning to report him to the finance police, not the regular police. If the driver does not change his tune by this point, then you can report him to the taxi company first, and then report him to the finance police. And if need be, call and/or go inside your hotel and make them come out and argue with the driver on your behalf.